This is the daily publication of the Publicity Department of the Agricultural and Mechanical College of Texas (Texas A & M) located in College Station, Texas. 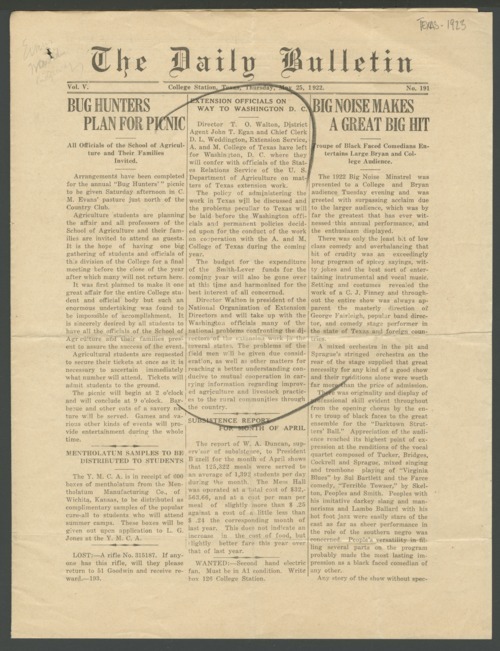 The lead stories in this issue are information about the "bug hunters picnic, extension officials going to Washington, D. C., and a troupe of black faced comedians performing on campus. Other pages have information about commencement activities, adds, and stories listing student names. To order images and/or obtain permission to use them commercially, please contact the KSHS Reference Desk at KSHS.reference@ks.gov or 785-272-8681, ext. 117. For more information see the Copyright and Permission FAQ. This website was developed in part with funding provided by the Information Network of Kansas.